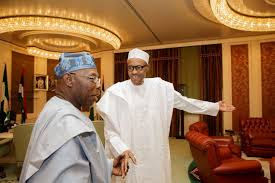 The Muhammadu Buhari-led federal government has reacted to the allegation by ex-President Olusegun Obasanjo that government had placed him on a watch list preparatory to arrest and embarrassed him. Government said it has no intention of framing up the ex-president or any Nigerian for that matter. “The Buhari Administration will not be distracted by frivolous allegations from any quarter, especially those cleverly choreographed to divert attention from a widely-acclaimed presidential proclamation and to shore up support for a waning and egotistical cause. He added: “While those who have skeletons in their wardrobes should be afraid, even of their own shadows, innocent persons need not worry about any investigation, whether real or imagined. ‘’This administration will never engage in a frame-up of innocent citizens. That is neither in the character of President Muhammadu Buhari nor in that of his administration. “Only the guilty should be worried. To paraphrase an African proverb, a man who has no wife cannot lose an in-law to the cold hands of death. The Minister said it was “curious that the frame-up and witch-hunt allegations came a day after a major presidential proclamation reversing some past acts of injustice was made, to the relief and acclamation of a long-expectant nation. ‘’Apparently, the impact of this proclamation was too much to bear by those who, through acts of omission or commission, helped to deepen the wounds inflicted by the blow of injustice that followed an election that was widely acclaimed to be free, fair and credible, hence they felt the need for a red herring that will distract the nation. ‘’Added to that is the frustration brought about by the fact that the contraption they have so much hyped as a freeway to power has failed to gain traction. Obasanjo had, in his statement, said that he doesn't believe anyone can frame him and had dismissed the rumours since he has nothing to hide, but he added that if there is any truth whatsoever in it, he would be waiting.